So true! And yet each place that we went to we felt it was our duty to “see the sights.” Meeting locals and doing what locals do is even harder when you’re in places with cultural gaps as large and they are in Asia. A white person unfortunately equals a dollar sign. In Germany you can meet a local and have a conversation about their political system or have them explain what microbreweries they recommend. You have to work a lot harder in Asia to have an experience like that. 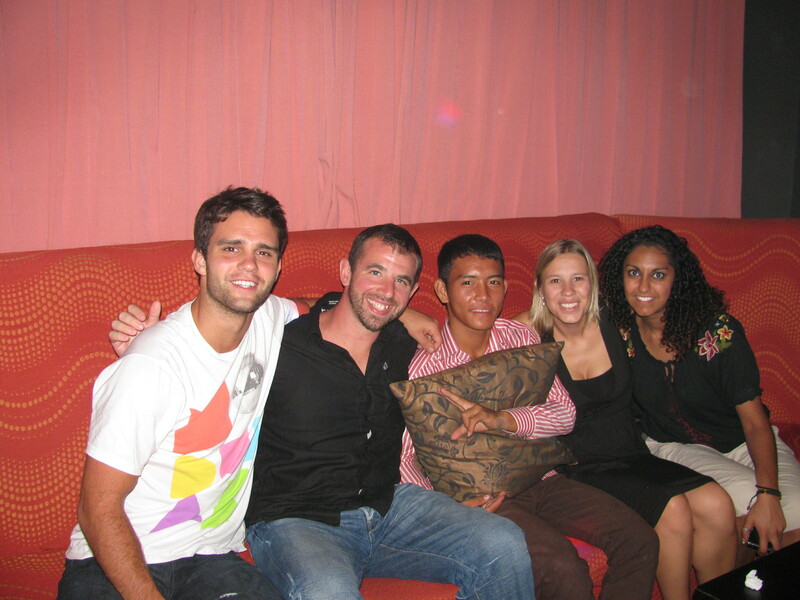 And we stayed at homestays, in local villages, met locals on buses – but there was always a wall up between us and Asia. We were simply tourists in the end. By the time we got to Siem Reap we were so excited. First of all, we could stay put for 13 nights! Second of all, we could take a break from museums, waterfalls, and more recently, war remnants. Going out into the village opened up even more for us though. We became accepted. There are temples in Ruluos (where we volunteered) and one day when we had to use a substitute driver(refer to tuk-tuk accident in previous post), he pulled up at the temples to find out which way to go. When we pulled up we were instantly surrounded by touts. The driver asked which way to the school and all the women instantly fell back, smiled warmly, and one said “You help at school?” “Oh thank you, thank you,” we were instantly vindicated. Our regular driver, Pom Sen, was our favorite link between Cambodian culture and ours. It took Pom Sen a week to grow on us. Being eighteen, he was more interested in flirting with girls, then being around on time to take us home. Also, his motorbike was constantly backfiring, leaving me leaping out of seat every time the sound surprised us. By the second week though, we treated Pom Sen like a mischievous little brother. We made fun of his cologne, teased him when we found him flirting when it was time to go, and I actually kicked him and demanded he go put some clothes on when he sat down in nothing but a towel and helped the school admins and I to cut up badges at the reception area. Pom Sen was always serenading us as well, mostly with Justin Bieber. Finally, when we met two other American volunteers, we decided it was vital that Pom Sen bring us to Karaoke one night(Always the rage in all of Asia). 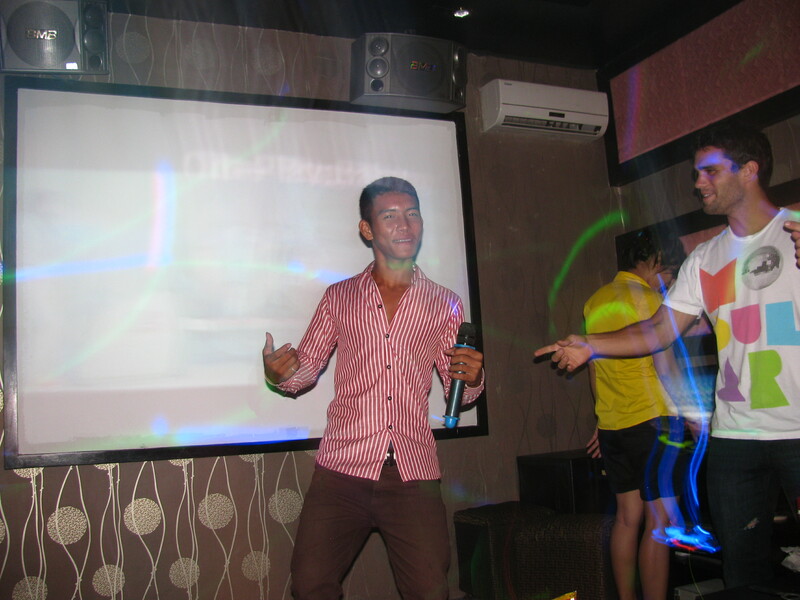 Well, I had learned before I left that a lot of Karaoke bars in Asia were, um, let’s say multi-tasking, but that fact has slipped my mind until Pom Sen brought us into a well-guarded club and we were marched past a dozen or so scandalously dressed and sulky women. We all looked at each other as we were led to a private room for Karaoke. It was a “what have we done” moment. But soon Pom Sen had the playlist going and was up and singing, and so we laughed and ended up making to most of our own private Karaoke party. 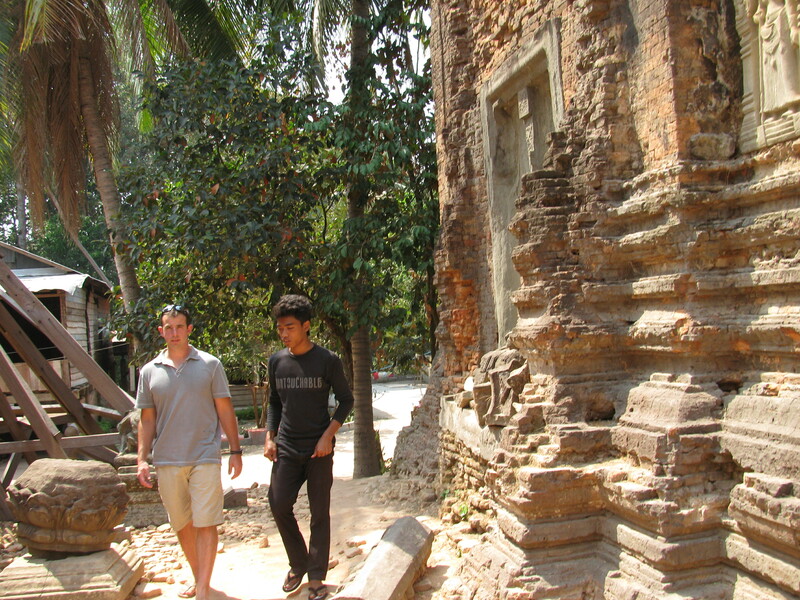 We finally decided we should see the ancient temples that were in the village we were volunteering. These temples were special to the villages, and most tourists who visit them don’t realize that they still have large celebrations at the temples at night, when they are closed to foreigners. One of the older orphans had aspirations of being a tour guide, so Tim coaxed him into accompanying us as our “guide.” We teased him by asking obtuse questions about each carving, but it was when we stopped asking questions and let him tell us about the legends behind each temple that we really were rewarded. We could sense that the temples held an importance to Seyha that we could never grasp, but it made our experience there seem less like sight seeing, and more like a friend showing us his backyard. We met so many great people working at the school. My favorite was Channtheng. She was the school receptionist. She may be the most beautiful person I have ever met. Her kindness, helpfulness, and sense of humor won me over instantly. She smiled excitedly each day we arrived. Laughed at our accents when we tried to say things in Khmer, and ran off her motorbike and hugged me when she watched our tuk-tuk fly in a ditch. Then she stayed by my side while the rest of the village helped Pom Sen fix it. We taught her and some of the other other staff and older kids “what’s up” so then she greeted us with it every day(bright smile included). We also began doing the “top gun” high-five every time we would see each other. She was, in short, my instant best friend. When Channtheng invited us to a village party, we couldn’t wait to go. We had no idea what is was. It went on at night and then again the next morning from 8am until noon. Tim and I had never heard of a party that happened in the morning, but we couldn’t go that night because Tim had been hauling wood in the mountains (long story). So we got there at 10am the next morning. It was explained to us only afterward that we had attended what is probably the equivalent of Thanksgiving in our culture, and the holiday origins are that the day is the death of Buddha, although every village celebrates at a different time. It was nothing like American thanksgiving. When we showed up, we were instantly greeted by Channtheng and many of the other teachers and students from the school. (Tim and I suspected that many of them arranged to be there at the same time us to help us feel welcomed and comfortable). We first had to make our way over to the elders table and make a donation in exchange for a gift. After that, two large table were pushed together full of people we mostly knew, amongst a crowd of around 300 people. We heard moaning through a microphone system. Khimchey, another teacher, explained we were outside the monks’ dining hall and the monks were saying their prayers. I could see them all knelt in the dining hall. We were served fish, rice, and sauce for the tables I watched what the others did an followed their lead. 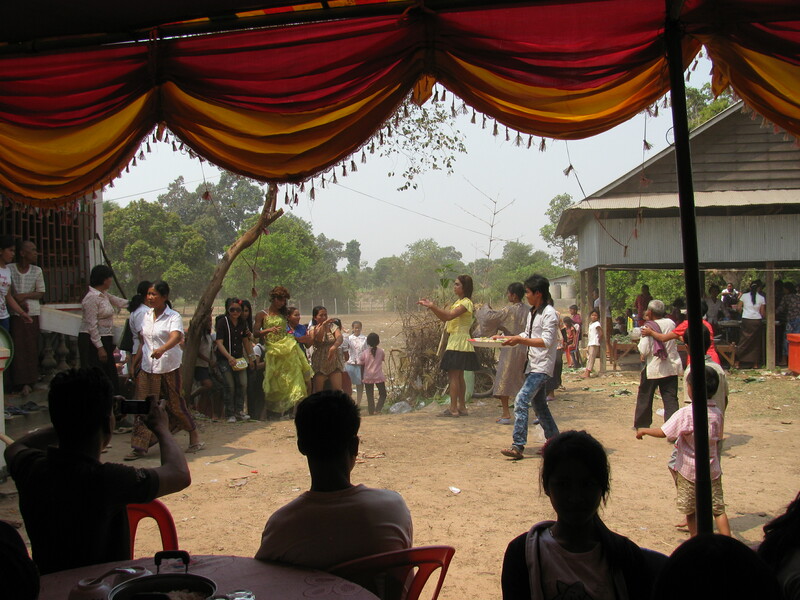 Then the prayers turned to traditional Cambodian music, and the strangest thing happened. We watched the villagers come out in drag and dance. The music turned briefly to rave music and more and more people stood up to dance, and at one point even turned into a Black-eyed Peas song. Our friends all demanded we get up and join in the dancing. Tim and I followed them, but tried to blend in to the background (this is not really possible when you’re the only white people). The drag queens ended up leading the entire village around the dining hall in almost conga line fashion. We followed in the back mostly just walking and clapping to the beat as the other villagers twirled around and put on a show. After the village party, we went back to Channtheng’s house with many of the others and met her parents (pictured). Even though they spoke no English, we tried to convey our thanks for them having us. The house was simple, and we never went inside. In Cambodia the eating area is usually out of doors and the house is mostly for sleeping. We were touched that we were invited to participate in their holiday with them, and invited to their home. We really saw what life was all about in rural Cambodia, and it turns out they have a lot more to be thankful for that Tim and I would have thought.